We snapped these photos during our recent weekend trip to Chicago! This was our second time to the Windy City and we loved it just as much as the first time we'd visited. We made a point to hit up some favourites from our first visit: RPM, Little Goat, Shake Shack (we don't have one in Canada! ), Pops for Champagne and Giordiano's. We were also able to try some new spots we LOVED like RM Champagne Salon (notice a theme?!? ), Sunny Side Up and Beatrix. I can't wait to go back! Styled to perfection from head to toe! I love how comfy and casual this outfit is! Looks so warm and cozy!! Love the way your styled this coat!! There's really nothing better than plaid and stripes paired together. Loving the xmas lights in the background. Great photos. This outfit is so perfect! 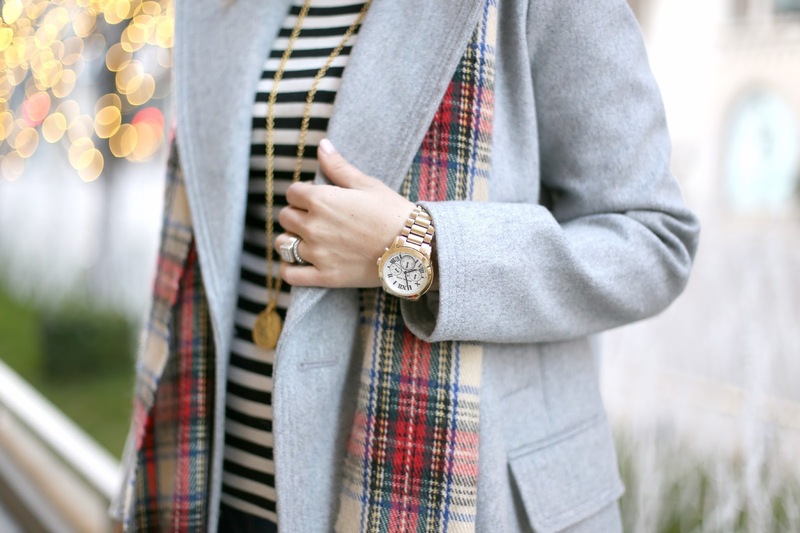 Love the mix of stripes and plaid! Love this, perfect winter look!! Yay, so happy you enjoyed Chicago! I love living here although the winters are rough. This is pretty much my uniform this time of year:) I have a great giveaway up on my blog, I hope you will check it out!